And with that line from the great bard, an entire continent’s avifauna was thus affected. As the story goes, way back in the late 19th Century and organization called the American Acclimitazation Society was working hard to introduce every one of the 600 species of birds mentioned in Shakespeare’s plays to North America. This was an ambitious plan, one undertaken at a time when environmental impact statements and concerns about established exotics were barely a twinkle in a bureaucrat’s eye. The AAS released some hundred European Starlings into Central Park in 1890 and 1891. 60 years later the species was resident from sea to shining sea, taking up noisy residence anywhere where habitat is slightly degraded, kicking out native species and squabbling for scraps in urban and suburban habitats, and generally making themselves at home to the derision of nature lovers across the United States and Canada. Make no mistake, many birders love to hate European Starlings. But why is this? The starlings display many of the characteristics that we, Americans especially, consider particularly becoming when applied to our own national character. They’re resilient and brash, resourceful and intelligent. But they’re also associated with dirty urban environments, they’re loud to the point of unpleasantness, and a constant reminder to the threats our native birds face every day. Plus, they’re sort of ugly. Not that the iridescent sheen on an adult European Starling isn’t attractive in its way when the light hits it just right, but when your native avifauna consists of orioles and warblers and hummingbirds, nothing the starling is dressed in can really compare. But we forget that the family Sturnidae consists of more than our familiar European Starling. There are some 90-odd birds in the family Sturnidae, most of which are named starling, and but for Shakespeare’s lack of specificity and the American Acclimitization Society’s lack of imagination we could have had any one of them on our shores instead of the ubiquitous European variety. 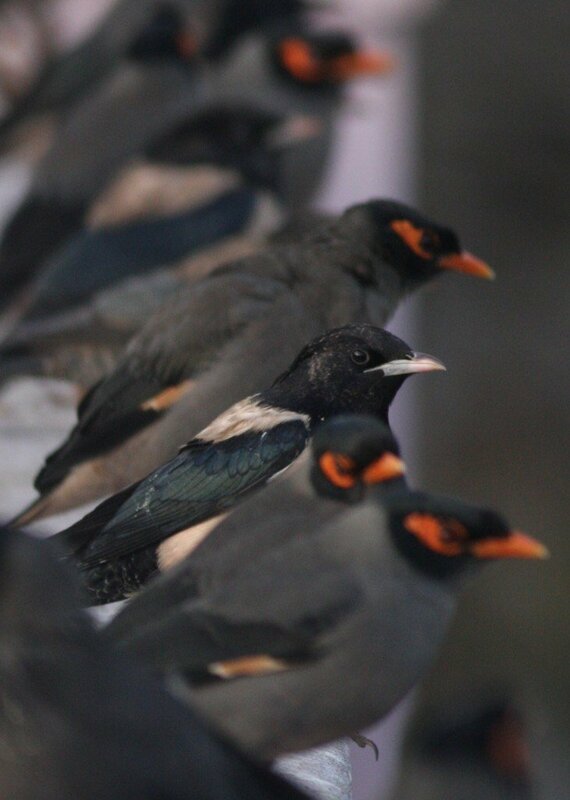 And would have still direct the same ire towards starlings if the specie sin question were a different one, like, perhaps, Central Asia’s gorgeous Rosy Starling? While in India last week for the 3rd annual Global Bird-watching Conference in the state of Gujarat, I had the opportunity to let my mind wonder “what if”? The default starling of urban areas in this corner of India are these remarkable rosys. The group I was with gathered in Ahmedebad (one of India’s mid-sized cities with only 8 million residents) to be transported by bus out to the conference site in Kutch. The bus turned out to be too small, however, and we were unceremoniously dumped on the street while a larger one was procured. That turned out to be a serendipitous arrangement, though, as the urban spaces of India are surprisingly birdy and my group quickly keyed in on a bridge overlooking a small creek. Under that bridge roosted dozens of Rosy Starlings comporting themselves in ways familiar to starling watchers the world over, but to me they were completely novel and, with their peach colored vests and little hint of a crest, sort of beautiful. 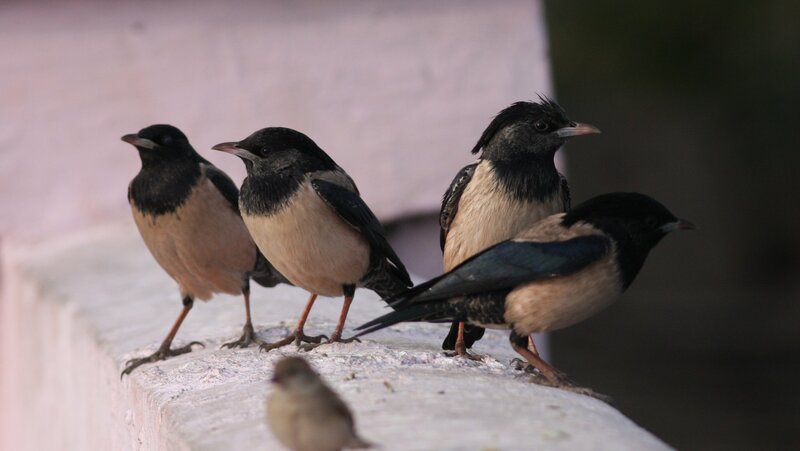 Rosy Starlings winter in this part of India in huge numbers. Like their more familiar co-geners they’re gregarious and urbane. Their vocalizations, to my ears, are near identical thought they don’t seem to lean on the whiny squeal European Starlings are partial to. They’re numbers were augmented by Bank Mynahs and Common Mynahs, together making up the bulk of bird numbers in Ahmedebad while the ubiquitous Black Kites made up the bulk of the bird mass. 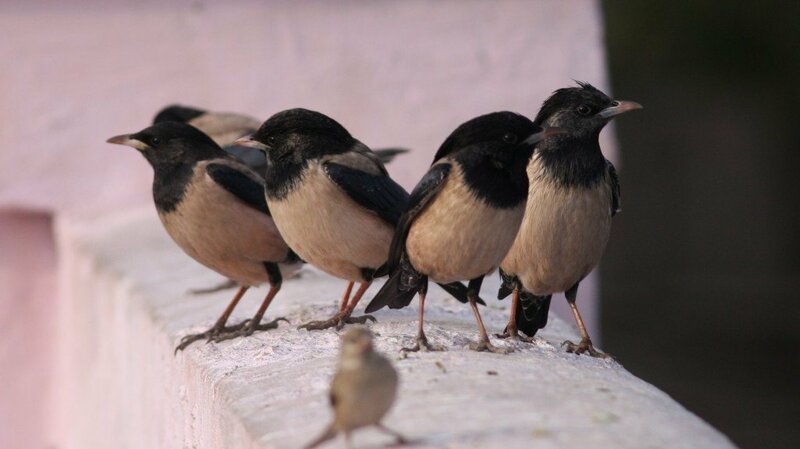 The birds would perch together on the bridge railings, but the Rosy Starlings being winter visitors and not year-round residents, were more skittish and prone to flushing in large groups to whirl about and ultimately return. An Indian city is chock full of disturbances, not just an endless stream of people walking down the street, but random packs of stray dogs poking about and trucks whirling by seemingly free from any semblance of traffic laws, so this happens frequently. Perhaps this is merely a case of the grass being greener on the other side of the world, or maybe my appreciation of these starlings comes from the fact that they are a bird species in the time and place where it is supposed to be (I felt a similar bit of contentedness when I saw House Sparrows on this trip), but I couldn’t help but think if my ambivalence towards North American European Starlings would be mitigated if the familiar eurasian starling was Rosy instead of Eurasian. Perhaps we can talk to the American Acclimitization Society about that. Assuming they still exist, of course. It’s an interesting point about Starlings, being an introduced species, exhibiting many thoroughly vaunted American characteristics, in a country who’s culture and mores were defined by European introduced species : ). To that effect, when I’m gallivanting out in the wild green yonder, away from urban bustle and graphic, pop culture America, the last thing I’d want to see in the subliminal national bird, the Eurasian Starling, in my naturey escape! It’d mean the city has followed me. I even feel a bit of that derision when encountering House Finches out in the wild. It just feels lame. But wouldn’t it be so much harder to hate them for the ecological damage they do? And… India?!? You’re crazy!!! Congratulations!! 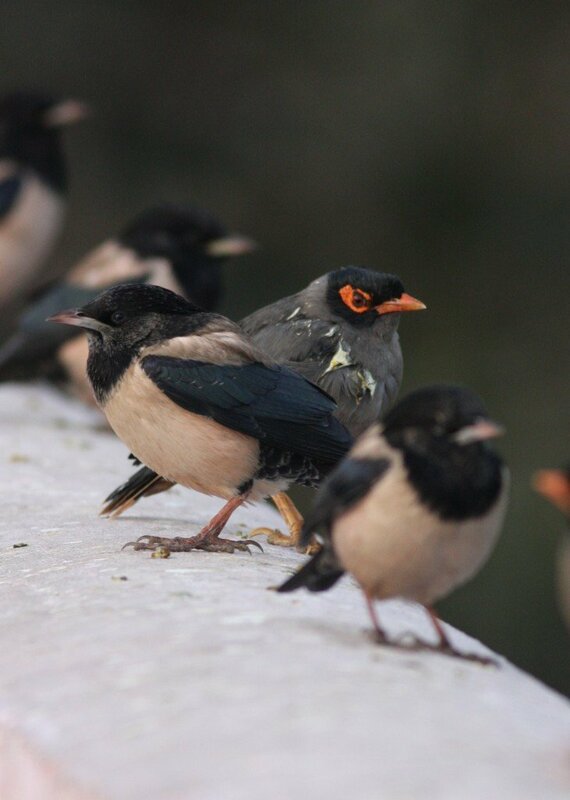 Rosy Starling is not completely implausible as a wild vagrant to eastern North America.